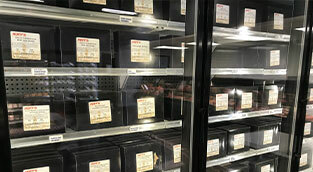 During the summer months, Hoff’s sells approximately 7500 pounds of brats per week! • During Holiday weeks that number increases to 20,000 lbs. per week. 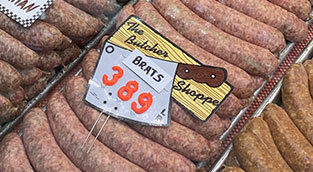 • Fresh in Hoff’s case daily – 9 brat flavors: barbeque brats, Cajun brats, garlic brats, Italian brats, jalapeno brats, onion brats, polish brats, potato brats and traditional brats. • One specialty flavor sold fresh every week. • The other 22 specialty flavors are available frozen. 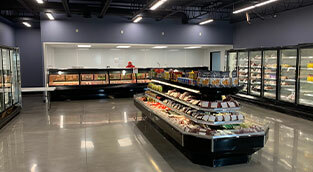 Hoff’s United Foods is a community-minded, family-owned business, fully inspected by the State of Wisconsin-Department of Agriculture. Additionally we are in full compliance with the Department of Agriculture’s HACCP (Hazard Analysis & Critical Control Point) program. We are also members of WAMP (Wisconsin association of meat processors) and AAMP (American Association of Meat Processors). • Every Friday and Saturday from April 1st through October 15th, Hoff’s sponsors a brat fry under the tent in the parking lot. • Area charitable organizations grill and sell brats, burgers and hot dogs to raise funds for their projects.